We are very proud of 2013 BA Design graduate Hefin Jones, who is the winner of this year’s Christine Risley Award for his graduation project “The Welsh Space Campaign”. The official award ceremony will take place on the evening of Thursday, October 10th, in the Constance Howard Gallery at Goldsmiths, where the space suit is on display until October 24th (entry to the exhibition is free). The Christine Risley Award is given annually to a Goldsmiths graduate for outstanding textile work, and Hefin’s project is definitely remarkable and deserving. 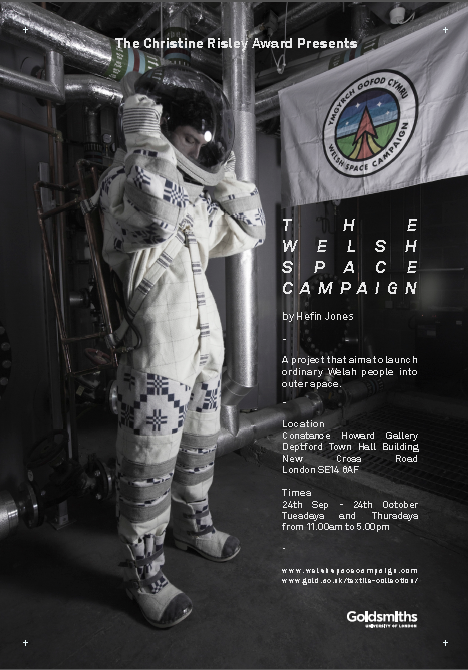 Hefin created a space suit from materials sourced in Wales and with help from Welsh craftsmen. You can find out more about the prize here; for more details on The Welsh Space Campaign, visit its website. ITV news also ran a story on Hefin and his space suit recently.